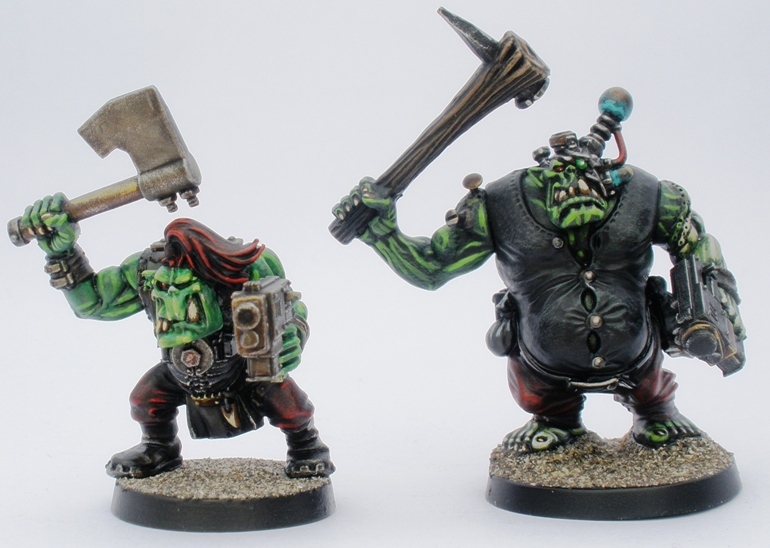 These guys were assembled primarily for Necromunda games back in 1998, but I didnt get around to painting them until 2009. I finally went back to them to add just a little bit of detail and take some photos this year. As all Electric Six fans living in the current pre-apocalyptic era know, only robots, cockroaches (and probably Lidl) will survive the upcoming Armageddon. Before you ask, zombies dont count as “surviving”. My own in depth research has also revealed that there is a good possibility that mutant, dog-sized rodents will live on in the undercities and eventually spill in huge swarms onto the irradiated plains above. Probably. In Necromunda the tribal native human “Ratskin” faction (which I will eventually get around to painting) survive in harmony with their destroyed environment. Part of this involves their nomadic lifestyle, with the Ratskin braves following the migrating swarms through the ruined industrial landscape. Hi-freakin-larious in other words and way too good a gaming opportunity to miss. Cue the theme from “Rawhide”. 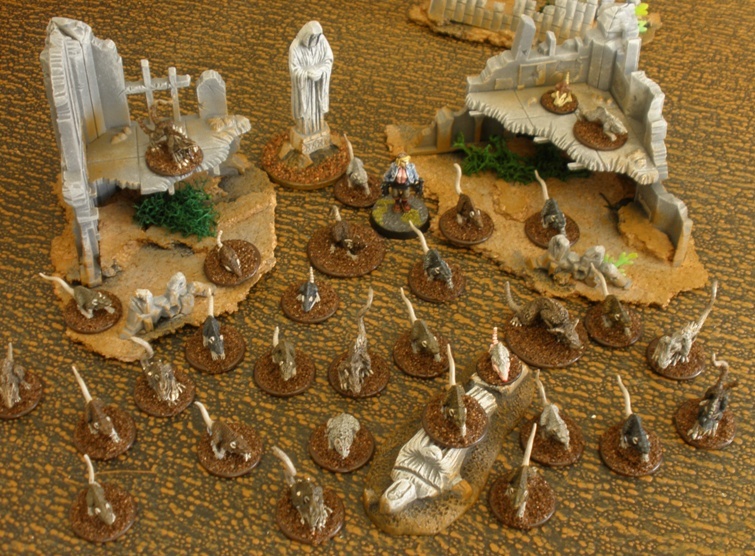 I put together the swarm from the rather cool mutant rats from Necromunda, a load of eighties giant rats from GW, a few of the plastic giant rats that were first seen in Warhammer Quest and a handful of the titchy rats that sat on the Heroquest furniture making a total of 31. The best figures are easily the Necromunda guys visible in the first photo, although a couple of the larger metal Warhammer guys are cool too. I have yet to get around to playing my “Rathide” cattle rustling scenario in the depth that I would like. I did run a prototype Rathide game of “Mutants and Death Ray Guns” testing the idea with MT back in 2009 though. 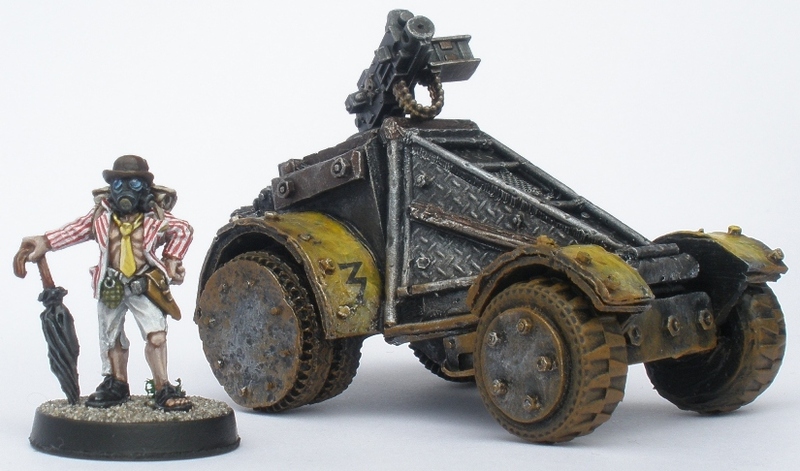 Whilst painted to be suitable for use by any of my PA figures, these resin models from Ramshackle Games are primarily going to be used as the vehicles for my “Bigdogz” ork mob in the post-apocalyptic Gorkamorka setting. 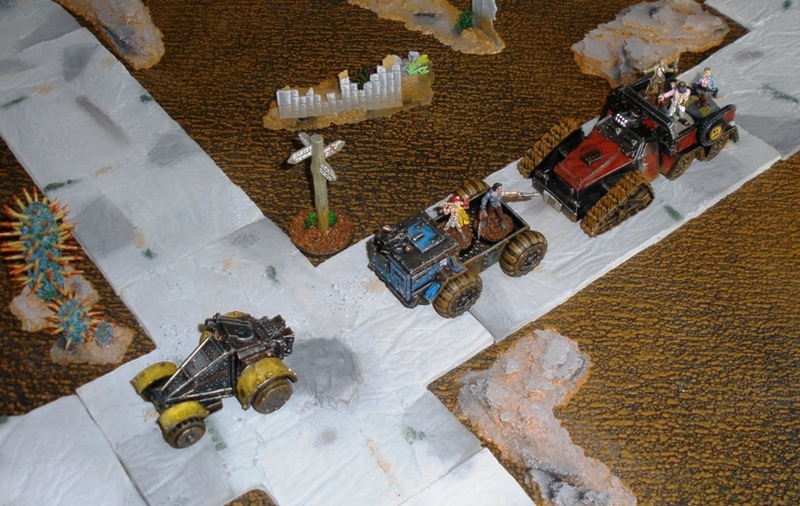 The vehicles were each painted in straightforward single colour schemes. Largely this was to minimise confusion in game terms by aiding easy identification. I was tempted to add some more rusty areas but I as I wanted the vehicles to look battered but serviceable, rather than disintegrating, I held back a bit. 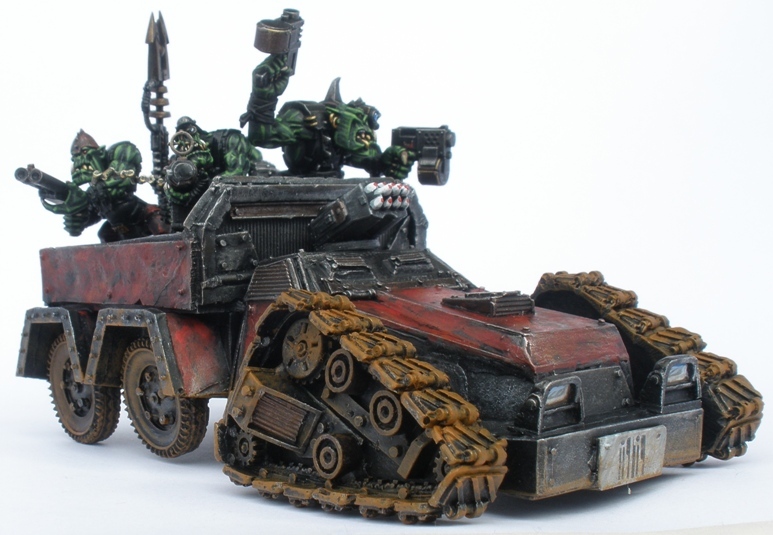 As I wanted to use the vehicles for non-ork-centric games as well as GoMo, I avoided too much obviously ork styling, even going so far as to add some more traditional sci-fi trappings like bar-code licence plates. I like the implication that while these vehicles are obviously pretty rugged and heavily abused, that they exist in an environment that still has some more advanced tech, somewhere. The weapons mounted on the vehicles are interchangeable mini turrets, attached by magnets. I made them from various gun parts that I had access to. Each weapon is mounted on a plastic disc which is glued to a washer. The washer then sticks to countersunk magnets on the vehicles. Simple but effective and convenient. No. 7 above is a cute design I think. It looks rugged and reliable. Nothing fancy but able to take a pounding. If I were stuck in a mehcanised post apocalyptic wasteland I think that of the three vehicles here, this is the one that I would choose as most likely to extend my lifespan. 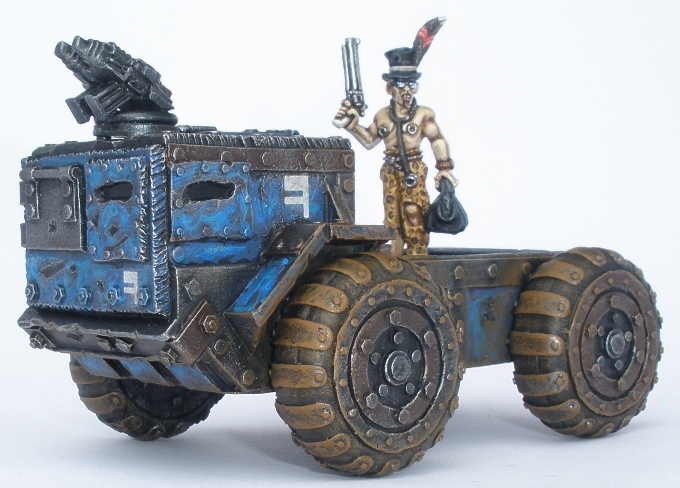 The enclosed cab would help with radstorms, mutie marauders, ripperjack swarms and the like. No 4 is a peculiar beast. Its a fun looking vehicle I think, but I think that I need to add “something” to the paint job: it is lacking a focal point. Its perfectly adequate for use as it is but there is something missing and I cant put my finger on what that missing thing is. No 3 is my favourite of the three. Not as reliable as No 7, but streets ahead in terms of cool. Of these three vehicles, this is definitely the road warriors choice I reckon. 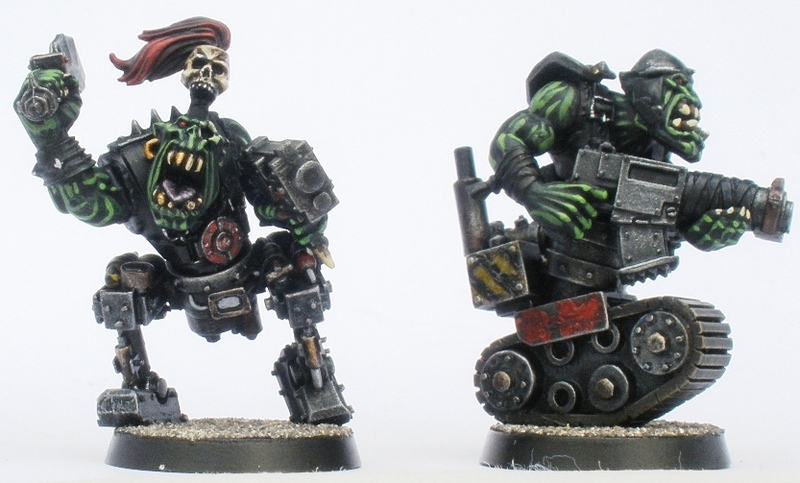 My main project in production (rather than in the research and resource acquirement phase) is a mob of orks primarily intended for use in Gorkamorka. 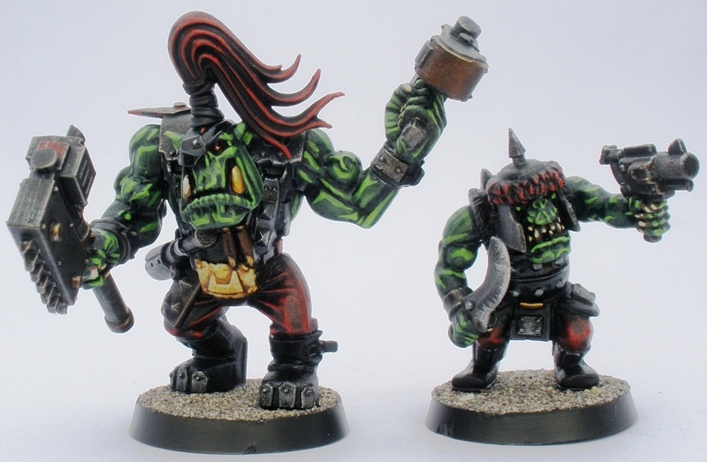 To that end I have bought some orks and added them to the other ork figures that I already had in storage. They are currently all in various states of WIP but the end results will look a lot like like the Bigdogz shown here. I spent some time working out a colour scheme and painting plan for these guys that would be both effective and easy to reproduce quickly. Details of that process can be found here and here. 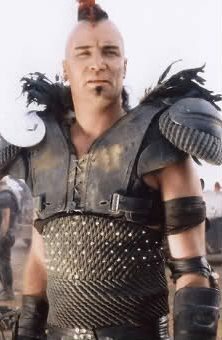 Suffice to say that a look that was reminiscent of Mad Max II was at the forefront of the process.